Chicken biryani is one of the delicacies that one normally partakes in restaurants only. That is because it is time consuming to prepare and often difficult to get it right. 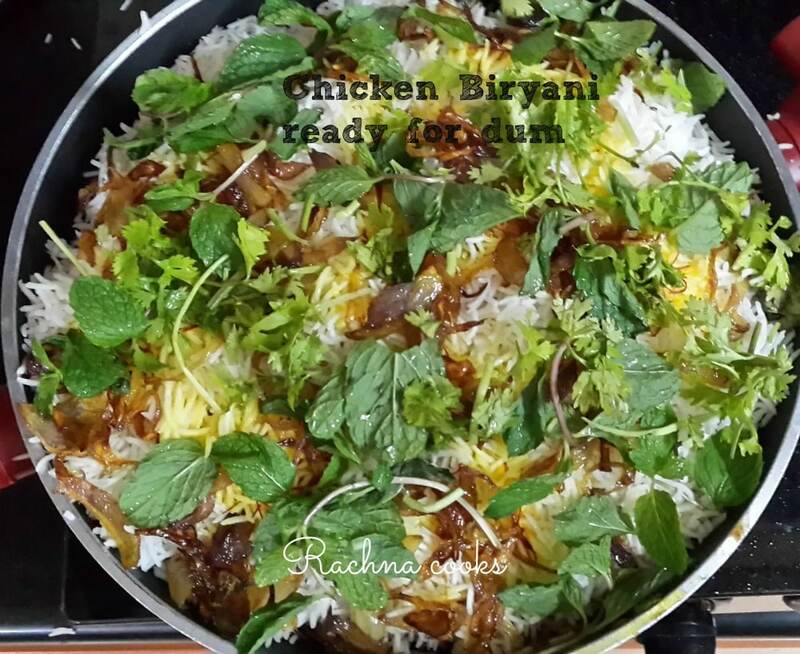 I used to prepare a version of chicken biryani earlier in which I completely cooked chicken gravy separately and rice separately which were then mixed together and served. It was delicious but my dum biryani in which I cook marinated chicken and basmati rice together on slow heat is yummier. 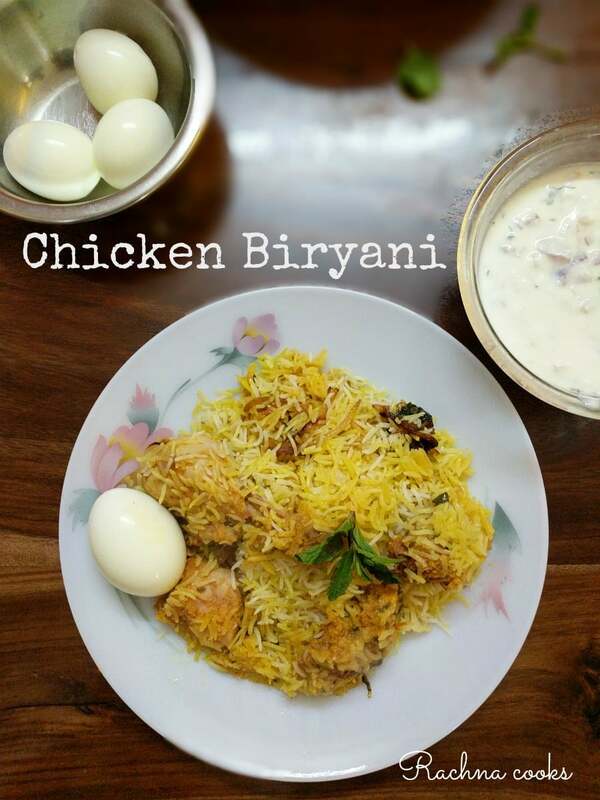 So here’s a recipe of simple chicken biryani made at home. 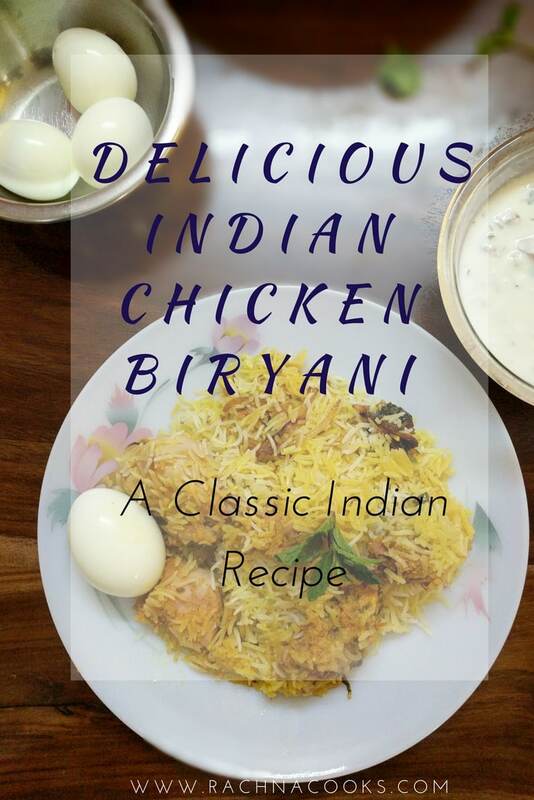 Now you can make your job easier by using store bought chicken biryani masala (I recommend Banne Nawab chicken biryani masala) which you can use to marinate your chicken pieces. But I prefer to make my own marinade. If you wish to cook chicken biryani with basmati rice, you really have to plan at least a day in advance. I prefer the meat to be marinated at least overnight for it to be flavourful. And since I have 3 men/boys at home, I make large quantity of it so that we can also enjoy the leftovers. You could adjust the quantities pro rata. Clean and dry the chicken pieces. Add 250 gm. curd, chicken biryani whole masala, 2-3 chopped green chillies, 3 tbsp. ginger garlic paste, 3 tbsp. ghee/oil, some fried onions, some saffron strands, 4 tbsp. oil and salt and mix well. Add in ½ bunch of mint and coriander finely chopped and keep this for marinating in the fridge at least overnight. Wash 750 gms. Basmati rice in water. Soak it in water for half an hour. Now heat water in a pan with some salt and bring it to a boil. Add the whole garam masala mentioned in the ingredients list with rice to this boiling water. Add in the rice carefully. Let it cook for about 4-6 minutes only. We only want to partially cook the rice or half cook it. Watch the rice carefully and drain it out at about 4-6 minutes. Set aside. Handle it gently to avoid it from breaking. Take a non-stick big kadhai/wok or a large pan with a thick bottom. We need a thick bottom or the biryani may burn. Now tip in the marinated chicken mix into the pan to cover the bottom. Now carefully spread the half cooked basmati rice over the layer of marinated chicken. Spread it out evenly. Add saffron water, fried onions, mint and coriander leaves. And then spread 3-4 tbsp. oil all over the rice. Now cover the pan with a tight lid so that no steam escapes. You could also put dough on the sides of the lid to make it airtight. Turn the heat on and put your wok/pan on it. After about 6-8 minutes when you notice steam beginning to form, put a heavy tawa/griddle on the flame. Put your biryani vessel on top of this tawa to prevent direct heat from reaching it. Now let the flame be such so that it just touches the tawa (slightly less than full flame). Cook for about 30-35 minutes on this flame. Then switch off the flame and let the biryani rest for 10 minutes. Take it to the table and serve hot with boiled eggs and raita as the side. It is really preferable to marinate the chicken overnight for good flavour. If you don't have saffron, you can use food colour though it is not the same. Be watchful of the basmati rice. If it is overcooked, it turns a mushy mess. You can use the same recipe for mutton biryani but the cooking time may be more for mutton. Take a non-stick big kadhai/wok or a large pan with a thick bottom. We need a thick bottom or the biryani may burn. Now tip in the marinated chicken mix into the pan. Add a layer of deep fried onions. For biryani rice preparation, half cook the basmati rice in boiling water with whole spices and salt. Drain and carefully spread the half cooked basmati rice over the layer of marinated chicken. Spread it out evenly. 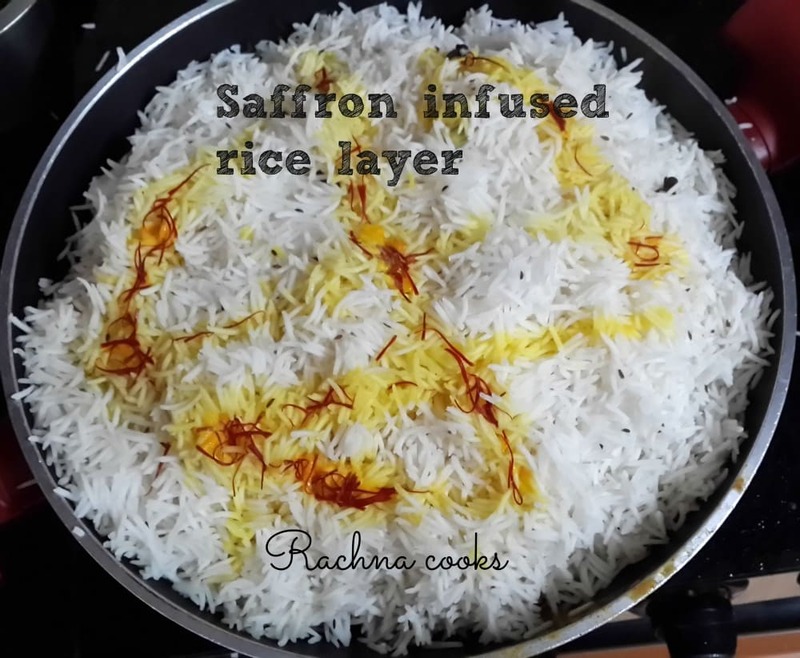 Add the saffron in milk infusion to leave beautiful orange streaks on the rice. The aroma of saffron is amazing! Add the remaining chopped mint and coriander leaves to the chicken biryani rice. Also tip in the remaining fried onions on the rice. Pour in 3 tbsp. ghee/oil all over the rice to prevent it from drying out when being cooked. Now cover the pan with a tight lid so that no steam escapes. You could also put dough on the sides of the lid to make it airtight. Turn the heat on and put your wok/pan on it. After about 6-8 minutes when you notice steam beginning to form, put a heavy tawa/griddle on the flame. Put your biryani vessel on top of this tawa to prevent direct heat from reaching it. Now let the flame be such so that it just touches the tawa (slightly less than full flame). Cook for about 30-35 minutes on this flame. Your entire house will smell great. Then switch off the flame and let the biryani rest for 10 minutes. Take it to the table and open the lid to absolutely appetizing aromas. Your basmati rice grains will be well cooked and glistening with pure ghee goodness. 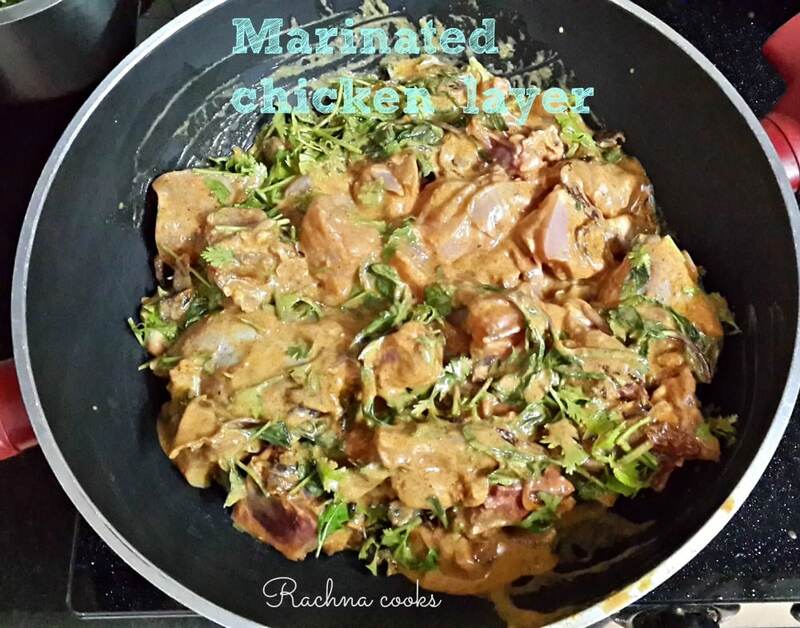 You will need to mix in the chicken and its masala with rice gently while serving. The chicken is well cooked and really tender. Serve with boiled eggs and a yoghurt raita made with finely chopped onions, tomatoes, mint and green chillies and garnished with salt and roasted cumin powder. Your delicious and simple chicken biryani is ready to eat. Dig in and relish the flavours. On this one day, don’t worry about the calories. Happy eating. Also check out the easier and less elaborate Chicken Pulao recipe. This sounds super simple and yummy. Next time I make biryani, this is how I will make it. And I’ll tell you how it turned out. Oh and I just noticed the tiles in your kitchen. Same pinch! Wow, this is one easy recipe and I have to try it. Not a big biryani fam but my hubby loves it so will make it as a surprise for him. I hope he likes it. It is my tried and tested recipe. Hopefully you will enjoy it. This would be my husband’s dream dish. Maybe, just maybe I can surprise him. Saving this one up. Okay comment disappeared. Trying my other ID. Can you rescue Obsessivemom from obscurity please? Done. Strange why it went into spam. Thanks for telling me. Wowowow now this is something that I would love to try out .. maybe this weekend itself.. 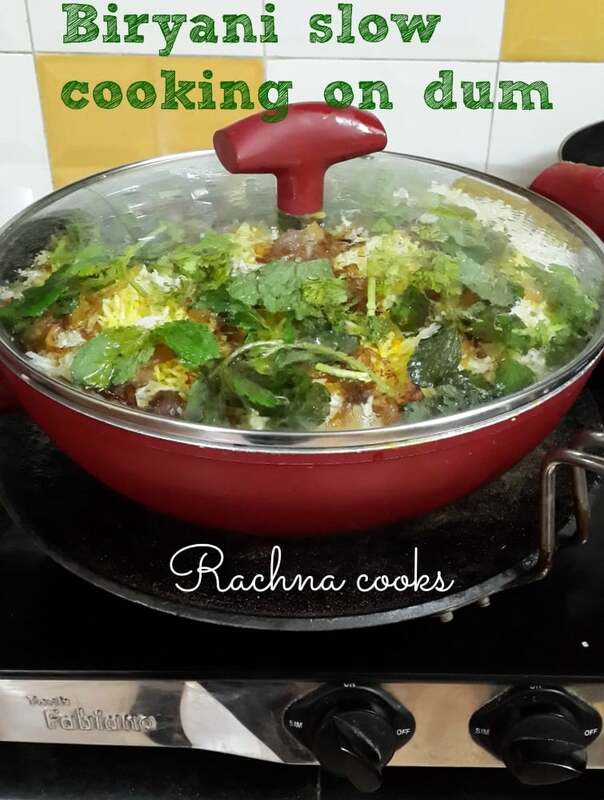 I loooove Biryani and make it only for special occasions simply because it is a lot of work! Your version looks too yum and even quite simple. Suddenly I have this Biryani craving. 🙂 And for a sec your biryani looked so familiar – we have the same plate (ditto :D) at home! Thanks, Shweta. So what do you have? 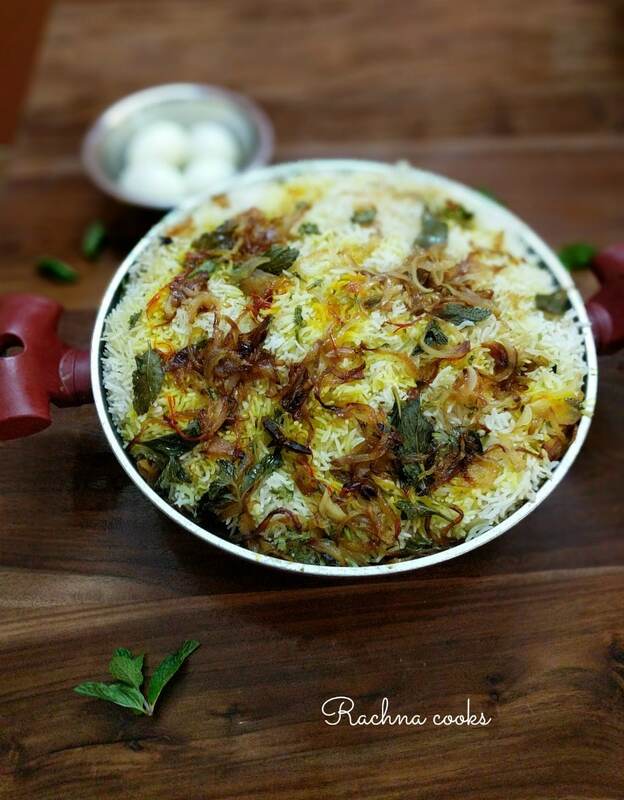 Veg biryani or egg biryani? Thanks, Roshan. Oh that’s strange about the pinterest thing. I checked and it got pinned using the same button. I wonder what went wrong when you tried. Read it all Rachna, step by step and carefully soaking in the steps, looking at the pictures and then thought, will Rachna invite us to her place? Such cooking at home? I can not even imagine 🙂 🙂 Aren’t you awesome? I guess we all have our tried and tested versions. 🙂 This one has been delivering good biryani since a few times now.